Our Magento 2 installation is done, sample datas set up, we can begin to work on our development environment. Before, I recommand you to make some configuration in order to not waste time when you develop. With caches, you can win time execution when your website is online. But during the development, it’s better to disable its. 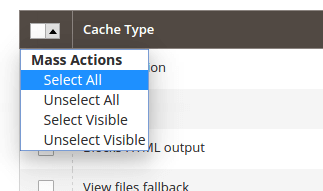 When you modify some configuration file or other things, you need to flush caches. Sometimes you forget it, and search why your module dosn’t work, and it’s because caches are enabled. Although you can run Magento in default mode in production, we don’t recommend it. production Intended for deployment on a production system. Exceptions are not displayed to the user, exceptions are written to logs only, and static files are not cached. You can modify your PHP ini in order to show warning as error, and have a good quality for your code. All these modification above are only for development environment, don’t apply it on production !